On a recent visit to Japan I had the opportunity to visit Isesaki, a town in Gunma Prefecture about 95km north-west of Tokyo that is known for the production of a type of fabric called meisen. The development of meisen in the early decades of the twentieth century brought modern kimono fashions within the reach of many women for the first time. Weavers from Isesaki and other towns in the area had traditionally used thick thread from double or deformed cocoons to create robust and moderately priced silk. 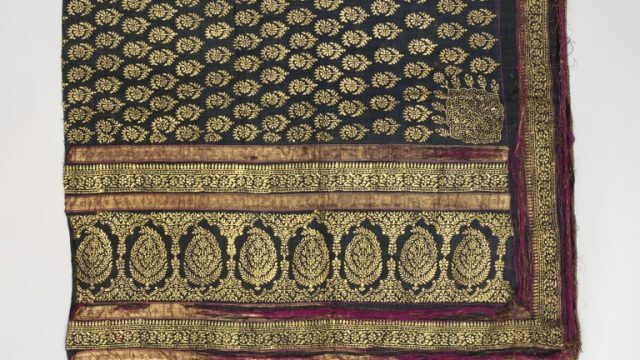 With the advent of mechanised spinning and weaving technology in the late nineteenth century, it became possible to produce a more lustrous and fine fabric that was still hard-wearing. Meisen was patterned using chemical dyes that were mixed with rice paste and applied through stencils on to warp (vertical) threads woven with temporary weft (horizontal) threads. After application of the dyes, the latter were unravelled and discarded and the true wefts woven in. This was a speeding up of the traditional kasuri (ikat) technique, by which sections of yarn were hand-tied or compressed in certain areas to prevent the colour penetrating when the skein was dipped in the dye bath. The new method produced the characteristic blurred outline of kasuri, but also allowed for the creation of more complex designs, particularly when a system for stencil-printing wefts as well as warps was developed. In the 1920s and ‘30s exuberant and colourful meisen designs had great appeal among fashionable, urban, middle-class women. Advertisements featuring famous actresses were used to promote meisen kimono, which were sold in enormous numbers by the big department stores. But the wearing of meisen declined dramatically after the 1950s and now there are only a few artisans in Gunma Prefecture who still make the fabric. 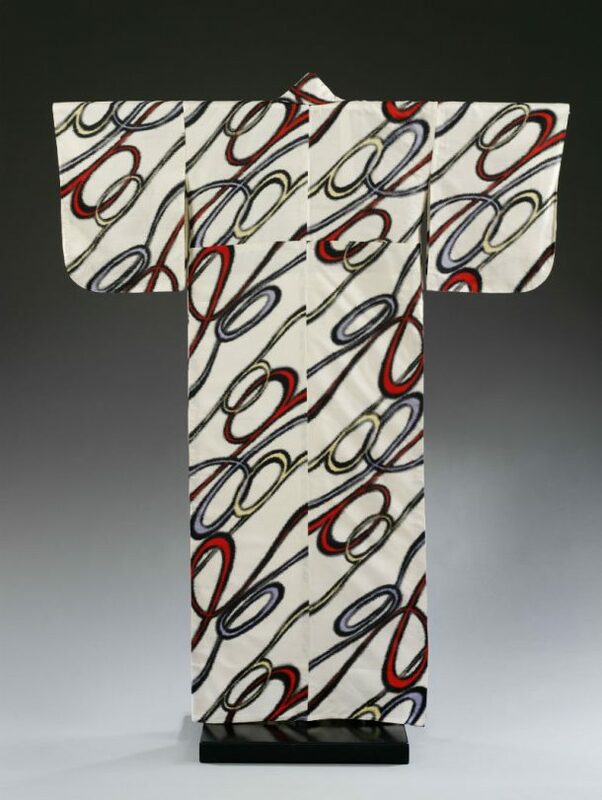 We have a number of meisen kimono in the V&A collection and I have read much, and even written about, the technique. I have never, however, actually seen it being executed, so this was to be a rare treat. 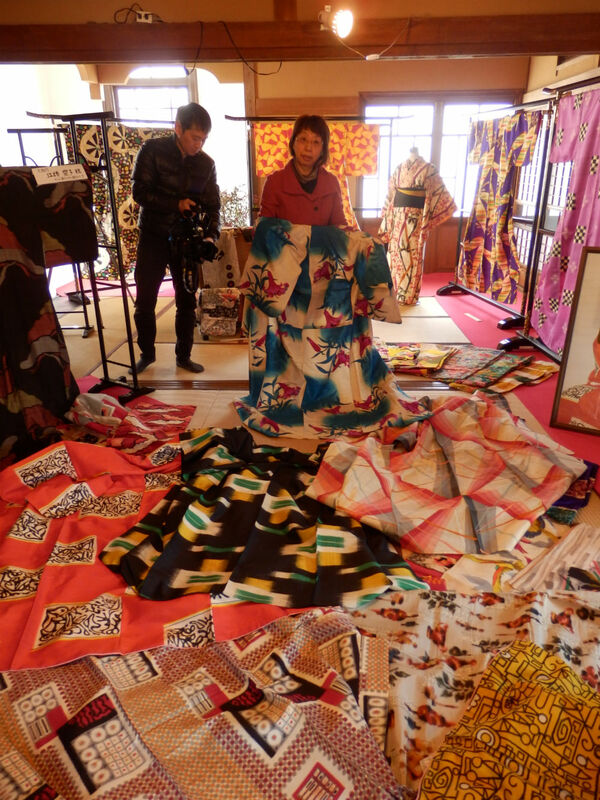 My trip had been organised by Reiko Sudo, the Creative Director of Nuno who create wonderful and innovative fabrics and clothing. We caught the Shinkasen (bullet train) from Tokyo Station to Honjō-Waseda, where we were met by the supremely elegant Michiko Sugihara. This dynamic woman runs her own software company, but has taken up the cause of preserving and promoting meisen. She was dressed in a striking silver-grey kimono with giant polka dots. First we went to the small Isesaki Meiji Museum where the curator Tamayo Kanai has amassed a large collection of meisen kimono. Much to my horror, my arrival in the town – and the possibility this presented of promoting their cultural traditions – had been capitalised on by Ms Sugihara and Ms Kanai, so waiting for me were journalists from the local Jōmo newspaper and from NHK (the Japanese equivalent of the BBC) who proceeded to interview me and to film and record the day’s activities. I had only arrived in Japan the day before and had slept very little, and indeed hardly at all on the overnight flight from London, so I can’t say I was looking my best for a TV appearance. 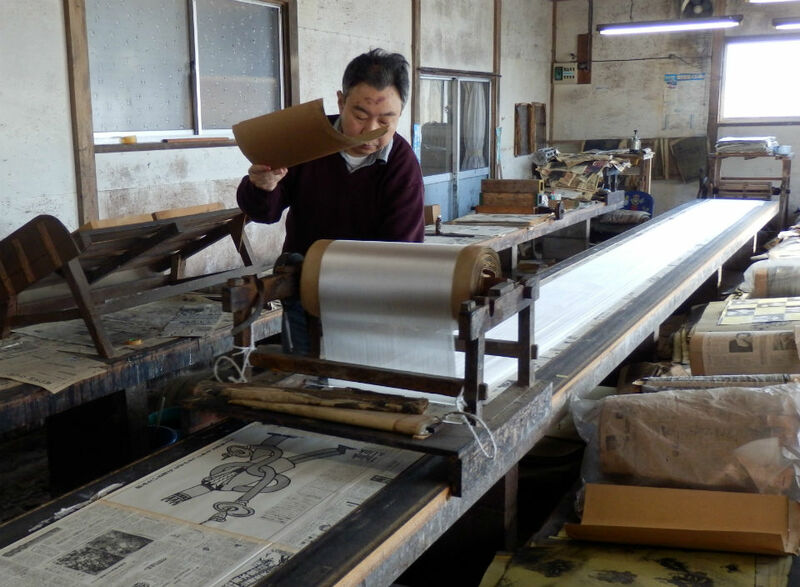 After viewing the collection in the Isesaki Meiji Museum we drove to the dyeing workshop of the Ishii family, who had, until recently, worked in partnership with the Kijima family. 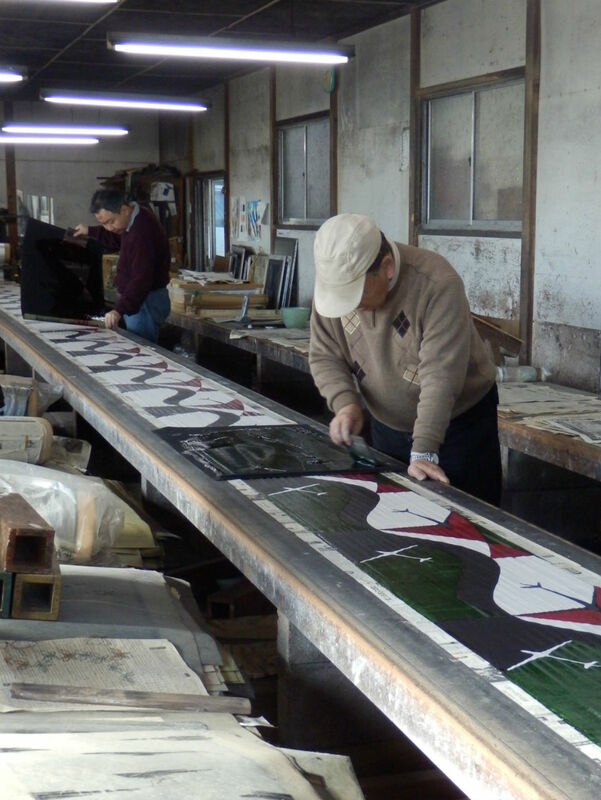 The latter had long been producers of meisen in Isesaki; they supplied the threads and orchestrated the work of the dyeing and weaving workshops. Sadly Mr Kijima died, unexpectedly, two years ago effectively leaving Mr Ishii and his son without employment. This was the first dyeing they had done – set up especially for me and the cameras – since then. Mr Ishii still had many of the warp reels previously prepared by Mr Kijima; one of these was unrolled along long narrow boards covered with newspaper. I had always been puzzled about the ‘temporary’ wefts that were unravelled after the dyeing of the warps. This pre-weaving sounded to me like a lot of wasted effort, but now I could see that the weft was very widely-spaced in a zig-zag arrangement, merely holding the warps in alignment. 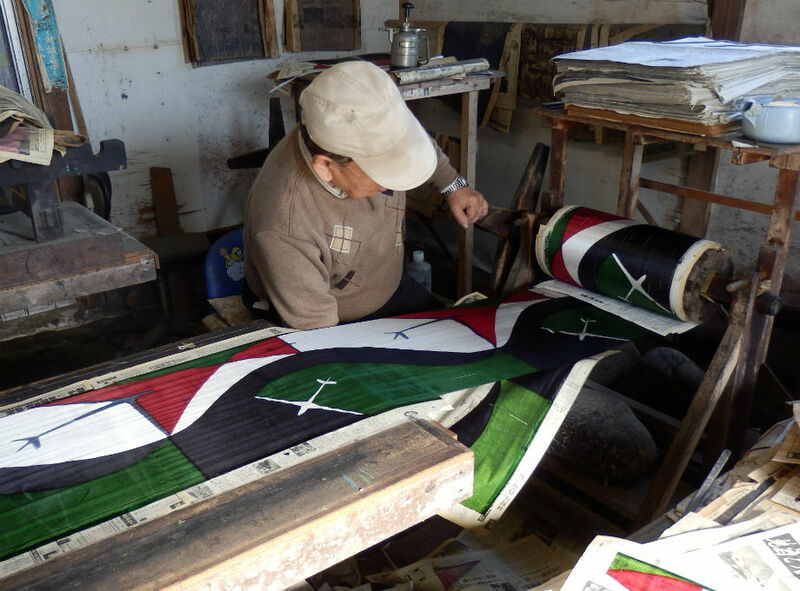 Coloured paste was applied to the warp threads through a stencil using a spatula. The stencil was then lifted and carefully re-positioned on the next section and the process repeated. 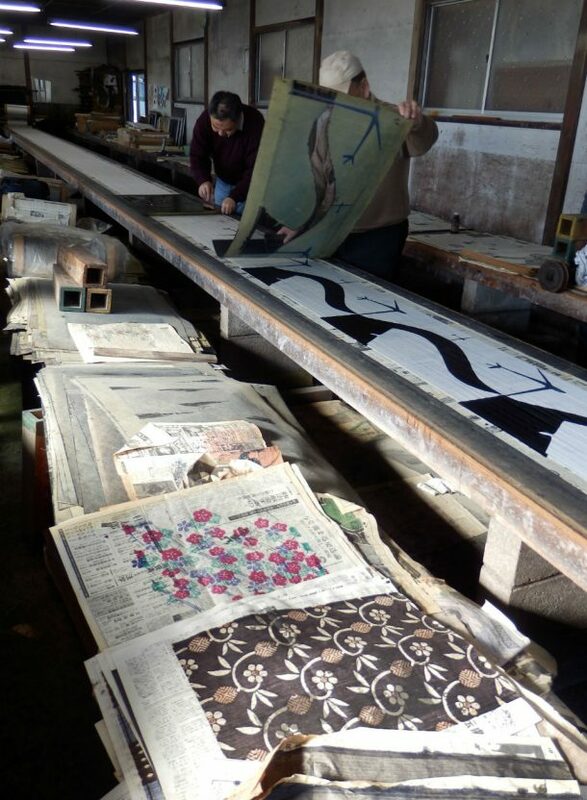 Stencils are traditionally made of mulberry paper, but the Ishii family use ones made of plastic, while the paste is made from the konnyaku (konjac) plant. One stencil was used for each colour – blue, black, red and green (with some areas left undyed) – and the full pattern gradually evolved with each application of paste. Father and son worked in tandem (a stencil each) and with speed. It was fascinating to see the stylised pattern – of planes flying over a landscape – taking shape. This particular design was created by Takashi Tanimoto in 2003. Before the dye was fully dry, the warps were re-rolled, the sheets of newspaper beneath being stripped away and new sheets placed on top as the warps approached the spool. 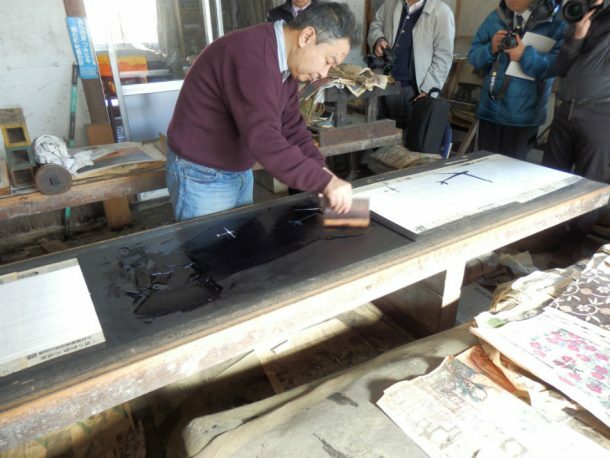 Mr Ishii explained that old newspaper is better than modern, as the latter is thinner and less absorbent. It is also important that the paper is printed only in black and white to avoid coloured ink leaching on to the threads. The threads were to be steamed to set the colours and then the spool would then be sent to nearby Ashikage to be woven with the true wefts. As it happened, Reiko Sudo had already used meisen of the very same design, produced in the Ishii workshop prior to the death of Mr Kijima. Inspired by what she saw, she ordered a further 150 metres of cloth to make into clothing, bags and cushion covers. After a few more comments from me for the media, we took our leave of the workshop and went for a late lunch, hosted by Yukihiro Tanaka of the Jōmo newspaper group. 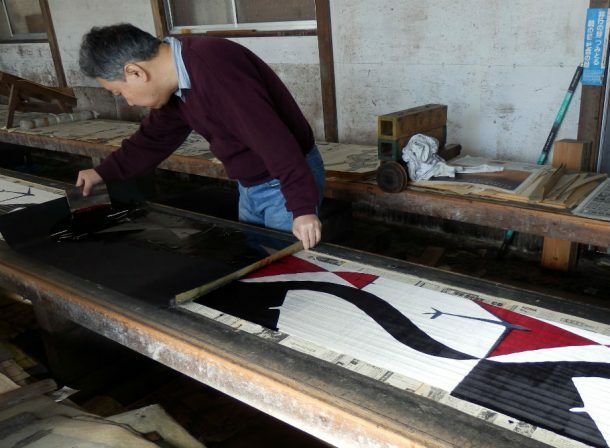 Mr Tanaka has done much to preserve traditional crafts in Gunma Prefecture and is hoping to stage a meisen exhibition at the Prefectural Museum. Vintage meisen kimono are incredibly popular in Japan and every year Ms Sugihara stages a fashion show featuring such garments. Talk over lunch, however, was about how to make the industry viable today, how to engage more artists in the creation of modern meisen designs, and how to ensure that the skills of Mr Ishii and his son can be preserved and passed down to the next generation. Thank you for this demonstration. I once read that the artisans that the authors and compilers of the first Encyclopedia (Diderot and d’Alembert) “interviewed” were rather reluctant to share their knowledge, whether they were coopers or coppersmiths or weavers. Indeed, they were horrified when they realized the Encyclopedie came with engravings of all their “secret” techniques in great detail. I would have thought the Japanese craftsmen to be even more reticent, but they seem to share freely and I hope the old techniques can be preserved and not too easily be superseeded by simple industrial processes and designs. In the past Japanese textile artisans would have been more reticent about sharing the secrets of their particular skills. This was especially true of dye workshops which would carefully guard their recipes. Today, artisans know that publicising their craft helps to preserve it, although of course it still takes many years to master the various arts. All those involved in my day at the meisen workshop were very happy when I said I planned to blog about it. A very clear explanation with good photos–except for not covering the means by which the weft threads are dyed. I do not find that information anywhere else either. The workshop I visited specialised solely in the stencil dyeing of the warp threads, so I didn’t have the opportunity to see wefts being dyed using this technique and I am not sure it is still practised. However, in the past the wefts would have been wrapped around boards for dyeing; I was shown some of these in Isesaki Meiji Museum. Dear Anna, I was given your name by Roger Yorke in Canada when contacting him regarding an appraisal for an antique theatre women’s wedding Uchikake. I inherited it from my late father who bought it through Japanese friends in Tokio in the 80s. According to Roger it is 1900-1920, very rare and a unique piece. I would likeep to sell it as I don’t have space to hang it and want to make sure it goes to someone who appreciates it. I have some photos with details. Am based in Canterbury,UK. Can you help? Looking forward to your reply, I believe you are THE expert for antique kimonos in Europe?